ULAN BATOR, Mongolia -- The Dalai Lama elevated a group of Mongolian monks into the Buddhist priesthood's higher ranks Friday, bolstering the country's traditional faith as it struggles to re-establish itself following decades of communist persecution. With hundreds of onlookers gathered outside, the secret initiation ceremony was held in a temple at Gandantegcheling monastery, the main seat of Mongolian Buddhist worship and learning in Ulan Bator, the capital. No details were released and it was not known how many monks had been promoted. The ceremony is believed to involve an examination and instructions from the Dalai Lama on adhering to 256 rules of Buddhist conduct, including celibacy. The ceremony came in the middle of the exiled Tibetan leader's weeklong visit to Mongolia, which shares strong historical links to Tibet. Tibet's esoteric, or tantric, school of Buddhism, of which the Dalai Lama is the leader, was adopted as Mongolia's de facto state religion in the 17th century. Three centuries later, communist purges killed more than 10,000 monks and destroyed most of the country's temples. By 1944, Gandantegcheling was the only official Buddhist institution left functioning. New monasteries have since been built and the Dalai Lama's seven visits to Mongolia have been credited with helping to revive such institutions. However, the lack of a central figure of authority in Mongolia has led to internal squabbling between monasteries and many young Mongolians also say they find the religion difficult to approach. Buddhism is also increasingly being challenged by Christianity and other missionary faiths that have attracted thousands of converts, especially among the young and well educated. China, which regards the Dalai Lama as a troublemaker seeking to overthrow its rule over Tibet, issued a mild protest over his visit to Mongolia. However, there were no reports of China cutting rail connections with Mongolia, as it did during the Dalai Lama's 2002 visit. 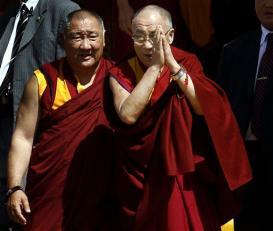 Mongolia has made public assurances that the Dalai Lama would not take part in political activities during his stay. Chinese communist troops occupied Tibet in 1951 and the Dalai Lama fled to exile in India following an abortive 1959 uprising against Chinese rule.